Hurom H-AI is part of the Alpha Series featuring a sleek design and optimized performance. Having a lot more to offer than Hurom H-AA and Hurom HZ, it’s the priciest of the three models. The design looks like an espresso maker, but when I realized what the top part is made for, it all made sense. It’s like a food processor was slapped on top of the machine that will do the cutting for you. You still have to slice your apple in half, but the clearance is wide enough for larger portions of produce. That’s a huge time saver. If you’re thinking of tossing your food processor after purchasing this slow juicer. Well, the bad news is it doesn’t really work like one. It’s too slow to achieve the same results, plus it has a hole at the bottom. The food it chops goes straight down the juicing chamber. The pulp collector of Hurom H-AI sits at the bottom of the juicing chamber. It makes it even more compact than standard slow juicers with just the juice collector detached from the whole assembly. Those are the main selling points of this juice press. In addition, it shares the same slow squeeze juicing technology with the other Alpha juicing machines. The only difference is the ice cream strainer and tofu press doesn’t come with the package. You can get this amazing juicer in either of these three shades—state blue, platinum silver, and rose gold. The Hurom H-AI Alpha Juicer was able to solve the most pressing challenge for slow juicers—narrow feeding chute. The usually small crescent-shaped channel you’ll find in cold press juicers requires a lot of prep time. Your produce has to be small enough to fit the tight clearance. With the bigger food-processor like top set, it can accommodate larger pieces of fruits and vegetables. Now, this is where the magic happens. It will then slice those big portions into small pieces, which self-feeds into the juicing chamber. 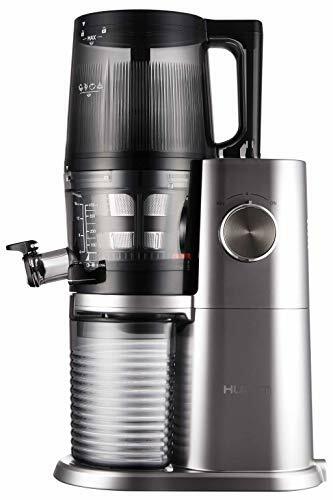 It’s a totally different approach in comparison to whole slow juicing technology offered by Breville and Kuvings, but it serves the same purpose. You might save some prep time with this feature, yet it doesn’t come without any compromise. It requires more parts, thus adding some complexity to its operation in general. Hurom juicers are not dishwasher safe. You need to exert a little bit of extra effort in taking care of their machines, and Hurom H-AI is not an exception. Add those extra parts to clean up like the cutting blades and filter basket, and you have your self a juice extractor that will take some time to clean. Juice extracted by Hurom H-AI Slow juicer is as nutritious as any cold press juice maker in the market. The slow squeeze technology minimizes oxidation of nutrients and produces more yield than centrifugal juicers. This makes the juice viable for storage for up to 3 days. The Hurom H-AI can process all types of produce—soft & hard food, citrus fruits, leafy greens, and you can also make nut and soy milk with it using the regular hopper. Hard produce includes sweet potato, fennel, cilantro, cucumber, beets, watermelon, apple, yakon, pumpkin, cauliflower, garlic, broccoli, carrots, celery, asparagus, pineapple, ginger, bitter gourd, turmeric, pear, and pepper. Using the coarse Ultem filter, you can make a puree out of mangoes, strawberry, melon, papaya, pomegranate, tomato, kiwifruit, cranberries, avocado, blackberry, peach, and grapes. Leafy greens include cabbage, collard greens, parsley, brussels sprout, wheatgrass, pine tree needles, moringa, peppermint, kale, dandelion greens, lettuce, basil, spinach, spring onion, and beet greens. Citrus fruits include grapefruit, lemon, tangerine, lime, mandarin, and oranges. Hurom H-AI Slow Juicer is not intended for beginners or for those who don’t have the budget. Operating this machine has some degree of complexity to it, and it’s a little bit pricey. I also don’t find the addition of the self-feeding top set practical. Adding sharp blades to a slow juicer defeats the purpose of being one. Hurom H-AA and Hurom HZ are great juicing machines, but the AI model doesn’t really connect with me. However, if you feel the other way around feel free to check it out on the link below.